1) How many Famicom games are compatible with the Data Recorder (or any old tape recorder, according to the article)? 2) What kind of wire would you need to connect a recorder and the Famicom? Well, I looked on the list topic and didn't see anything like this, so I figured why not introduce it? As far as I know, you need the Family Basic keyboard to do it, since it has the line-out/line-in jacks for you to connect the tape recorder. I'm not aware of any other attachments that let you do it. Are you sure that Castle Excellent supports it? It's usually only games that have an "edit" mode. Loderunner -- I swear I read this supported it somewhere, but I can't figure out how. Well, In the Japanese version, pressing A on the second controller brings you to a "SUB COMMAND" menu that allows your to reset a room's status, restart the game entirely and such, but intrestingly enough there is a SAVE and LOAD function. Trying the SAVE feature apparently did nothing, and trying to LOAD after that froze the game (apparently trying to load data from a recorder that isn't even plugged up, I suppose). You can also access the SUB COMMAND menu in the English version of the game, Castlequest, but as I remember there no SAVE or LOAD options there. the hori game repeater also has a line in/line out jack for the tape/data recorder in order to record the saved footage. Is there a list of the cassettes tapes that could be used with Family Basic? An excellent question. Did anybody ever release commercial programmes on tape for Family BASIC? I think there were a couple BASIC offerings, but they may only have been in book form. They call cartridges 'cassettes' in Nippon and throughout Asiam so it gets a bit tedious to explain what I'm seeking and although I've seen books with BASIC programmes for the FC before, never once have I seen a commercial data tape, and I've asked several firms and individuals to look for them over the years. It does strike me as interesting that there is no Famicom printer either. I know there were books published with sample programs for Family Basic (I have one, myself). I also know that there are other books that came with cassette tapes that had programs/backgrounds on them. I don't know if any of them are "official" or not, though (via Hudson or whoever). Yes, I also know for a fact that there were several book/tape combos. I almost bid on a lot of them, but it also came with a bunch of stuff I didn't need and would probably be hard to resell (do I really need another keyboard and Basic cart?). I can confirm that saving and loading your own edited stages in Lode Runner works. In edit mode press SELECT to go to the menu. The screen will be black with just the text "MENU" on screen. Press select again to browse to the other options. Pressing start chooses the current option. MENU goes back to the title screen, SAVE is for saving to tape and LOAD is for loading from tape obviously. This works in the US version as well. The keyboard (or other compatible device) must be connected or the menu won't appear when pressing SELECT. I tried this in an emulator as well but I couldn't get it to work even though the keyboard is selected as connected. According to Japanese Wikipedia, Nuts & Milk can also save with a tape recorder, but I can't figure out how to do it, and I don't have the manual for that game. This is probably a false rumour. When looking into the ROM no such routine could be found. On a side note, you might not need a Family Basic Keyboard to save in all these games (except for the Family Basic series of course). There's the S.D. Station that supposedly can be used to plug in earphones to the Famicom but can also be used instead of the keyboard to save to tapes. The Ascii Stick II Turbo also has the line-in and -out jacks for this purpose http://www.ne.jp/asahi/oroti/famicom/cont15.html. I'm not sure the Hori Game Repeater also can be used for this purpose or if it's just to save the recorded button presses. Arkanoid II is now confirmed to save edited levels to tape. I had trouble loading my level though, and it turned out scrambled. I have that book and cassette. I'm pretty sure the cassette is just Family Basic stuff. 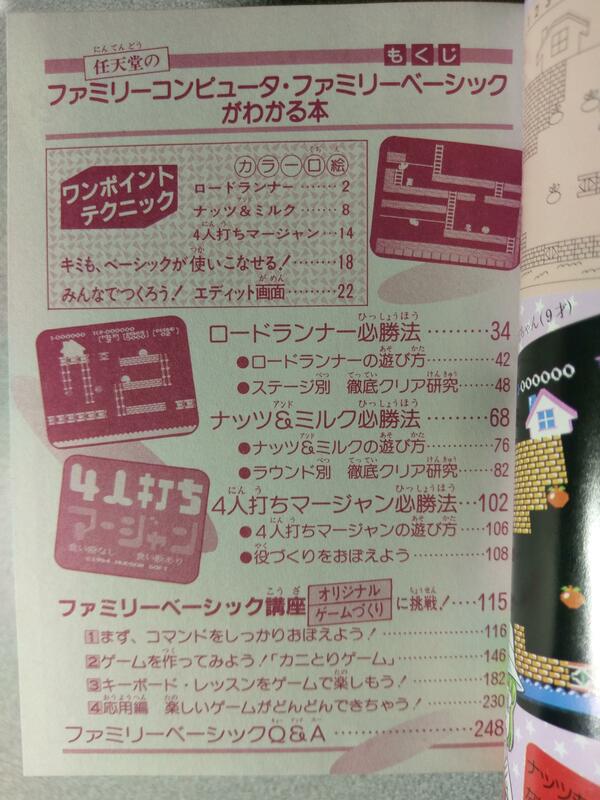 Does the book have some kind of guide for Lode Runner, Nuts & Milk and 4-nin Uchi no Mahjong? It looks like it on the pictures. From what I can tell of the picture of the cassette tape, it only contains the 10 Family BASIC programs that UglyJoe already uploaded (Kani Tori Geemu etc). Even though the Runner is the one presenting the cassette. I'll take a look at the book tonight, if I remember. I think it just has a guide for the other games. It's a woman speaking in Japanese explaining what is about to be loaded, then it's a bunch of noise as the data sections get played. Turn down your speakers / headphones before playing.